In 2014, bud break was on May 6. In 2015 it was very early – April 26 but this year, it was on April 12! 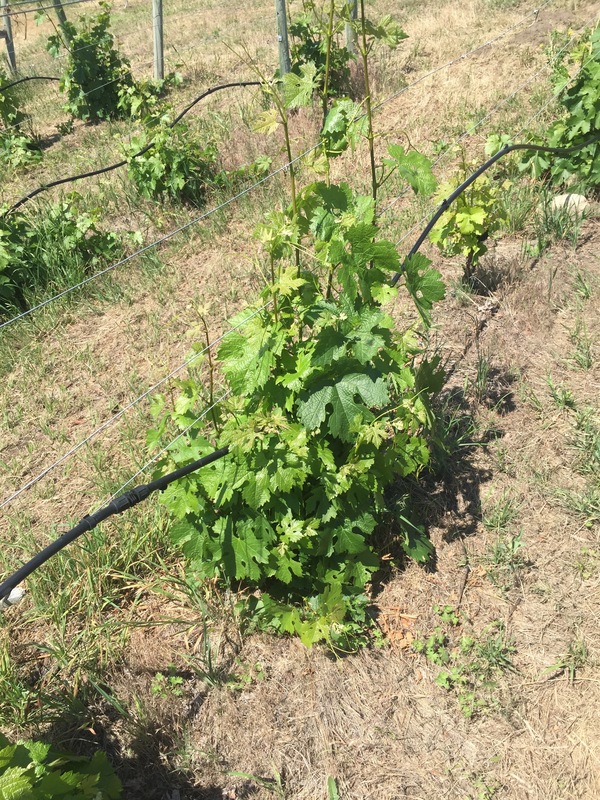 See the comparisons between the pictures of the same row in the Pinot Noir, clone 459 block from 2015 and 2016. September 22. Starting again at 6am, we picked the last 2 parts of the “O Block”. We again instructed the pickers to be extra vigilant, just as on day 1, and also again went through each of the bins as well. The “O Block” has a European Pinot Noir clone but we do not really know exactly what it is. That whole block was planted, self rooted, in 1990. The 2 blocks were vinified separately in 2 open top fermenters, approx 2,200 lb in each. Wild ferment was started the same way as with the previous vats, and again with approx. 50% stem inclusion. September 21. Starting at 6am, 15 pickers arrived from Vinifera. We picked the first 7 rows of our Clone 459 (“A-Block”) that was re-grafted in May 2014. In total it was 220 vines. (They gave pretty much a full harvest of excellent quality less than 18 months after re-graft.) We also picked 2 parts of our “O-Block” this day. We instructed the pickers to be extra vigilant, throw away any bunches that are not up to par, cut away if there are some berries that are not perfect and of course no leaves or sticks. Kajsa and I sat at one bin each and sorted further the whole time they were picking. By 11am we finished picking for the day, and were on to processing at the winery. We had then 2 Bins of Clone 459-1150lb of fruit put into one fermentation vessel with 55% stem inclusion, the remainder de-stemmed, whole berries. Of O-Block we had 2,200 lb in each of 2 fermentation vessels with 50% whole clusters. Dry ice was then placed on top twice a day while the fruit was left to sit for 5 days for cold fermentation. We used entirely wild fermentation, which started after 5 days when we warmed up the vessels a bit and added juice from 2 carboys we kept at home on the patio to get the fermentation going. During the late summer of 2015, when we got more and more involved in making the decisions and doing the work in the vineyard, we started thinking more and more about going further and actually making the wine ourselves. It is of course a big step, but it was also the natural next step, and if that step is to be made, now is better than next year. Since you have to have a winery and a licence to produce alcoholic beverages, we decided to do what many others have done – rent space in an existing winery with extra room. Our friends at Foxtrot did not have room for our operation so we talked to the talented people at Okanagan Crush Pad who are doing a great job in their winery but also especially on the viticultural side. We were seriously considering going there, the people are great, but our problem was that they are too far away for us, making it difficult for us to be seriously involved in all aspects of our winemaking processes. We talked to a few wineries in the area, but were then introduced to Richard Roskell at Marichel Winery. They are a small grower and producer of Syrah and Viognier and they did have some excess capacity which would fit our production perfectly. We hit it off immediately with Richard, and a few weeks later we were bringing our first harvest in to begin our processes at Marichel. Several factors with Marichel and Richard were so perfectly in-line with our goals and visions in our venture…from not only the proximity to our vineyard and home, but as well to the freedom of access to the winery, the equipment we needed and the gentle support of thoughts and suggestions from Richard when needed. …so began the long journey from grape to wine…. In September, we worked the final blend of the Henricsson Reserve. We tasted all 12 barrels numerous times and settled on 5 that we felt would be interesting to include in the final blend. We took more samples and started blending and seeing how different barrels worked together. On September 17, we brought samples over to some friend’s house and three couples, all with substantial experience with Pinot, sat down to agree on the final blend. After a lot of discussions and arm wrestling, we agreed on using 4 different barrels in proportions of 5% – 40% each. We felt pretty good about the result and are very excited to see how this wine will develop with age. The bottling was done, unfiltered and unfined in the first week of October 2015. 25 cases in total. Rechecked the results from the grafting of the Chardonnay Block. This block is very gnarly and certainly has much less vigorous growth of everything – vines, grass and all vegetation. Very rocky soil and the vine trunks are also less thick than in the other blocks. Arnie Erickson told me that he had big problems getting anything to work there originally, he had to replant many more vines there than in the other areas. It seams to be difficult to get even 2 tonnes to the acre here, but the fruit is very flavorful and mineraly. Canopy is much smaller and less vigorous in this vineyard than the others. Since the last count in mid June more than 100 additional cuttings have taken in the Chardonnay block. 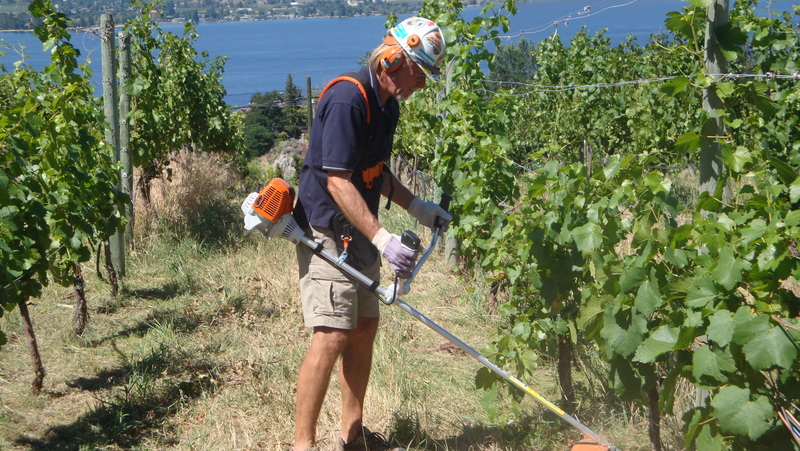 In June there were 275 vines that had not taken, but now there are only 170. And most of them are in one particular area so I think this is a problem with the soil, not the quality of the cuttings or the work done there. So now the success rate in the Chardonnay vineyard is up to exactly 80%, up from 67.6% in mid June. All the new Pinot Noir blocks are looking really great and it is over 95% success rate for all Pinot Noirs. There is also vigorous growth that has been trimmed and we have saved 1-3 clusters per vine on the best looking ones and are planning to make some wine from them – very exciting to see how that goes.